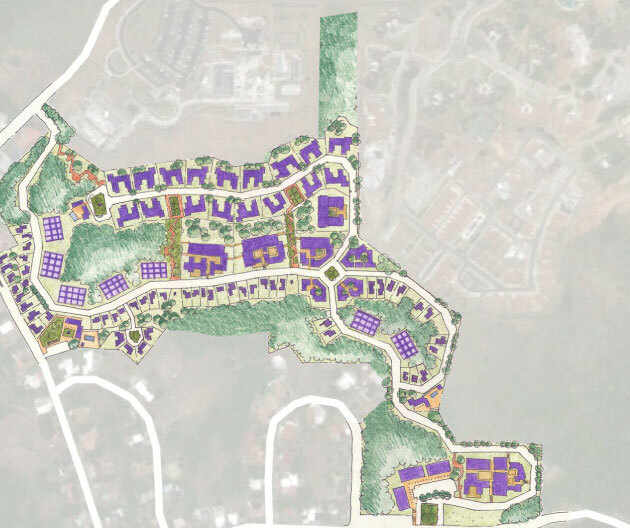 The Embassy Hills project is situated on a narrow, hilly, 20-hectare site in Clayton, Panama. The site is bounded on the east by the United States Embassy and on all other sides by recent suburban development. The scheme provides a rich mix of residential types along streets that are slow, multimodal, well-planted and adjacent to a variety of parks and greens. A mixed-use village center is located on the southern end of the site. Despite the severe topographical constraints of the site, the design creates the ambiance of a charming hill town neighborhood. Individual, single and multifamily dwellings provide maximum privacy for residents, while the urban form and shared facilities promote a traditional sense of community. This project will be a unique place to live and, upon completion, will become a national precedent for future market-driven, neighborhood-centered development in Panama City.